I have not done a very good job of keeping up with my plan to go through the entire Bible this year, which is not too surprising! Life gets busy, and this gets hard, but I am trying to get myself back on track this month. I have actual read or listened to 1 Peter countless times over the last few weeks, but I just keep putting off writing about it. Here are some thoughts I had from Apostle Peter’s 1st of 2 New Testament epistles. Christ is Holy, and we are supposed to be like Him. It will not always be easy to be holy, and we must mature in our spirituality, but ultimately our goal should be holiness and purity, despite our culture and surrounding influences. In fact 1 Peter says that, as Christians, our holiness should set us apart from our pagan culture. I know he was writing to early Christians, but those words still ring true today. If we can manage to truly live holy, Christ-like lives today, then we would absolutely stand out in American culture. Peter says that non-Christians should see our good deeds and recognize us as different. Unfortunately too many of us are the hypocritical Christians that Peter speaks of, with one foot still in our old lives or one foot still engulfed in worldly living, while we have our other foot stepped toward Christ. We need to grow up as Christians and take another step toward holy living, leaving behind our old selves for good so that we can be shining lights into this dark world. Love, respect, honor, integrity, honesty, compassion and humility all seem to be key elements here. 1 Peter 3 has always challenged me. How can we be a witness to others if we do not know what we believe and why we believe it? Also, if we know what we believe, but we share our beliefs in a way that is full of malice or arrogance, then what good is that in reaching other people with the Good News of Christ? If we go about things the wrong way, it only makes us look like hypocrites and fools. This is a theme I keep hearing over and over again all throughout the Bible. Submit to leaders and authorities. Submit to your husband or wife. Submit to your bosses or masters. Submit to your elders. Submit to God. There is no room for pride and arrogance in Peter’s advice. Be humble and practice humility. Peter reinforces the Biblical call to be baptized. Personally I have a mixed church background of various denominations that all baptize by immersion, but with slightly different views on how the whole process works. I grew up in and currently attend a Baptist Church, and Southern Baptist doctrine teaches that we get baptized as our 1st act of faith and obedience to following Christ AFTER we get saved. In other words, we accept and confess Christ as Lord, pray and take Him into our hearts, and confess all of this publicly. Then we are Christians, and the next step is to get baptized. We are not saved by baptism itself, but we are saved by the blood of Christ. Our salvation is not dependent upon baptism, but it is the first step we should take as new Christians. On the flip side, I spent about 14 years of my life in Restoration Movement Churches. First I was involved with Churches of Christ, and I went to Lipscomb University (a Church of Christ college) for both of my degrees. I interned with 3 different Churches of Christ in different cities during college. Then after seminary I spent 6 years working with 2 different Independent Christian Churches. Both of these denominations came from the Restoration Movement, but split for various reasons long ago. Restoration Movement doctrine tends to give baptism a larger role in our salvation compared to Baptist doctrine, and many believe that we are not Christians until we are baptized. They know that it is through the blood of Christ that we are saved, but they believe that the act of accepting that salvation is by being baptized by immersion, not just by a simple prayer. Some would even go as far as to say that we would go to Hell if we died in a car wreck on the way to get baptized, but I do not think that is the prevailing view anymore. I think most would say that God is not quite that legalistic and that He knows what is in our hearts. Honestly, the strictness of the role of baptism in our salvation varies from one church to the next. I can say that I have worked with older ministers who truly believed that we were not saved until we went into the water, but then I have also worked with numerous other ministers who think baptism is crucial to our commitment to Christ, just not so much that God would eternally damn us if we are believers who died right before we made it into the water. This is the biggest difference between Baptist and Restoration Movement teachings. Both churches believe the same things about the Holy Trinity and many other key elements of our faith, but there is a tension between these denominations about the role of baptism. 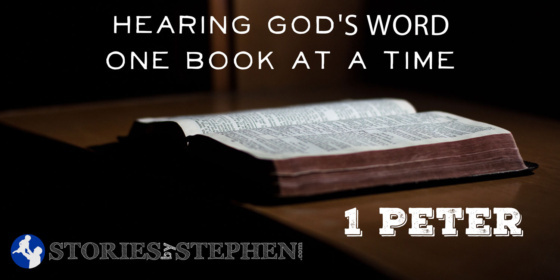 1 Peter 3 offers a little insight into the subject. I have read this passage over and over again, and I think either side could argue that it helps their view on baptism. Peter definitely makes it sound like the water saves us. He compares it to Noah and his family being saved by the water, and in the same way we can be saved by water too. Baptists could say here that Peter makes it clear that we are saved by the resurrection of Jesus Christ and by making a pledge to God, not by having the water wash away our dirtiness. Having been influenced by both sides of this argument, I come away thinking something along these lines… Water is not magical, and simply getting dunked in a pool by a minister does not automatically send us to Heaven if we were not doing it for the right reasons, with the right heart. I had a Church of Christ minister and friend who preached that if we could get everyone to Heaven just by making them get baptized, then he would go from person to person holding a gun to their heads and forcing them to get baptized, but that is not the way it works. Baptism without faith in Jesus and a commitment to follow Him is meaningless. Baptism goes hand-in-hand with the change God has made in our hearts. We can only be saved because Jesus paid the price for all our sins by giving up His own life on the cross, and believing that is absolutely essential to our salvation. Baptism means something because Christ gives it meaning. He gives it meaning when He gets baptized by John the Baptist. Christ gives it meaning in the Great Commission. Christ gives it meaning by His sacrifice. It is all about Jesus Christ. The New Testament constantly shows us that we should get baptized. There is no arguing that fact. It was important enough for Jesus to do it, and it was important on the day the Christian Church began at the Pentecost. If you want to be a Christian, then by all means you should get baptized! However you should only do it if you have decided in your heart to follow Jesus and commit your life to Him. Accept Christ, repent of your sins, get baptized, follow Christ with a changed heart and a changed life… Do these things because the Bible says to do them, and let God decide at exactly which moment you were saved, trusting that He knows better than any doctrinal statements. There are thousands of Protestant Christian denominations worldwide, and the reason there are so many is because no one has everything just right. I think neither Baptists or Churches of Christ have everything exactly right and that sometimes a group of Christians will draw a line in the sand that does not need to be drawn. When it comes to baptism, they divide themselves up even though they are teaching essentially the same thing with slightly different wording. One just wants to be more right than the other even though they are both probably almost, but not completely right. While churches argue, the best thing any of us can do is simply look at what the Bible says and then do what it says. If Peter and the rest of the New Testament tell us both that Christ died to save us and that baptism is an important thing that we should do as we decide to become Christians, then just do it already! Maybe you just read what I wrote about baptism and are thinking, “Yes it is time for me to do that!” Well I hate to break it to you, but Peter reinforces what we see all over the Bible. Those who are absolutely committed to God will suffer in this world for their faith. Many early Christians were persecuted, tortured, killed and falsely imprisoned simply because they followed Jesus. This still happens today in many parts of the world, as is evident by the brutal slaughter of Christians by ISIS. If you are like me, sitting in the comfort of your nice home in America where we are free to practice whatever religion we choose, you are not immune to suffering for your faith. It is just a different kind of suffering. You are not likely to be beheaded for your faith here, but you are likely to be an outcast in our worldly culture, especially if you are in high school or college. You will lose friendships and maybe even family relationships because of what you believe. At times you will feel like you are missing out on so much that the world has to offer, especially when you see old friends on Instagram making worldly living look so much fun. If you are a business owner, a leader in your field, a politician or you hold any position that puts you in the public eye, then be prepared to lose customers, jobs, votes and political alliances if you truly hold firm to your Christian beliefs. America is not a Christian nation, and while I am proud to be an American where we have so many freedoms that history did offer to our ancestors, I hold no illusions about the moral decay of our nation. Fortunately America is a place where, despite the growing hostility and public scrutiny of Christian teachings, Christians are still free to spread the word of God. Just know that it will not always be easy. There will be suffering, and there will be sacrifice. Ultimately it is more than worth it though. Take comfort in your suffering knowing that God is with you at all times and that countless other Christians are going through the same things. This is another thing I keep hearing everywhere in scripture. God blessed each of us with different gifts, talents, abilities and opportunities. We should use all these things to honor and glorify God and to build up His kingdom. God gave us these gifts for a reason, and He can just as easily take them away if we do not use them.